Do you have a vinegar tip, trick or recipe you'd be willing to share with Grandma's Wisdom? Just click on the link below and start typing! It's time to stop using all those chemicals to clean your home. Vinegar cleaning is the best solution for going green. White distilled vinegar is the best type of vinegar to use for cleaning because it has the most acid content. You'll quickly find that you can clean just about everything with white vinegar. It's a real simple way to make your home chemical free. Grandma's cleaning with vinegar tips and tricks will get your home clean, disinfected and chemical free. Everyday you'll either hear or read reports of the many causes of allergies. Chemical allergies aren't just from our industrial environmental problems. Many of these allergies are actually coming from our schools and homes, and the majority of the problems are coming from the chemicals in cleaning products. The cleaning products we buy in our grocery stores are loaded with chemicals that not only kill bad bacteria they kill the good bacteria that helps our immune system fight diseases and allergies. Going green isn't just a fad or a movement that will eventually fade away someday. 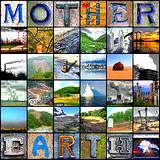 It's a natural and organic way to fight products that are not only making us sick but also polluting our water, air and soil. 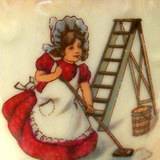 Vinegar cleaning is an old fashioned way of cleaning that really needs no improvement. Cleaning with vinegar dates back thousands of years and even though it's easier to buy white vinegar for cleaning and it's a lot less expensive than buying advertised cleaning products it's still the best for cleaning and your health. Mix vinegar and olive oil in a one-to-one ratio and apply with a soft cloth using slight pressure in a circular motion. Boil 2 cups of linseed oil for 1-minute then allow it to cool before stirring in 1 cup of white vinegar. Apply with a soft cloth then allow it to stand for 1-2 minutes and then rub off gently. Only works well if the stain is fresh. Combine 1 part of white vinegar to 3 parts of water and slowed to remain on the stain for 3-4 minutes. Using a sponge, rub the area gently from the center out then dry with a clean soft cloth. Try an area that is out of the way to be sure that the carpet is colorfast. White vinegar is capable of dissolving and softening chewing gum from a number of fabrics and carpeting. Apply warm vinegar on a sponge and allow it to stand for a few minutes then wipe with a soft dry cloth. For severe buildup of mildew, use white vinegar full strength. For all other mildew buildup, use a solution of vinegar and water. Combine vinegar and water one to one and wipe the furniture with a dampened soft cloth. Follow with a dry cloth to buff. Use a small amount of vinegar, baking soda or salt to prepare a paste and use the paste to clean bronze, copper or brass pots or utensils. Black stains on aluminum pots can be removed by boiling white vinegar in the pot up to the area of the stain. For large pots boil the vinegar in a small pot and pour it on the stain and let set for a few minutes then rinse. 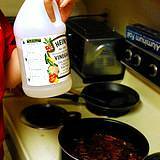 Mix one tablespoon of white vinegar to one quart of water. White Vinegar cleaning for any kind of glass or windows will stop all those awful streaks from grease build up. It will also take those ugly water spots off your glasses. It's also great for cleaning your eye glasses! Place a capful of vinegar in the dishwasher to cut grease. You'll be amazed at how your dishes, silverware, and glasses will shine. If you want your crystal to sparkle, just rinse them in a solution of: one part white vinegar to three parts warm water. Your crystal will not only sparkle it will smell fresh when you drink out of the glasses. Coffee pots, coffee makers, tea kettles and irons are notorious for hard water residue buildup. When they get really bad, fill them with white vinegar and run them through a cycle, then run them through a clear water cycle and you're appliances will be like new. Boil 2 cups of vinegar and pour it down the drain a small amount at a time. Allow the vinegar to remain in the drain for about 5-10 minutes before pouring a pot of very hot water down the drain. The alternative is to use ½ cup of baking soda poured into the drain followed by ½ cup of warm vinegar, cover the drain and allow to stand for 5-10 minutes before running cold water down the drain. This will also freshen your garbage disposal. Drop 3-4 Alka-Seltzer tablets down the drain then pour a bottle of white vinegar down. After 3-5 minutes run hot water down. Remove the head and place it in a container that will allow you to cover the head with vinegar. Allow soaking overnight, rinse and replace. Allow pure hot water to run through your shower for a few minutes and you'll notice a big difference in the spray. Pour undilluted white vinegar on weeds in sidewalk or driveway cracks and you'll see how fast the acid from the vinegar will kill weeds without the worry of harmful chemicals around your home. Add 1 teaspoon of cider vinegar to every quart of water in your pets water dish. Fleas will not go near your pet. Here's a little trick I use every summer to keep fleas out of my house. Fill a spray bottle with half white vinegar and half cold water then go around your house and mist your furniture, rugs, drapes and anywhere fleas like to hide and lay eggs. Try this every time you're ready to vacuum and you'll be surprised how this little trick will get rid of not only fleas but ants, spiders and just about any critter that's lurking around your home. Besides killing the fleas the acid will also kill the eggs. And best of all, everything you mist then vacuum will be cleaner, brighter and smell fresher. Don't worry, vinegar evaporates your house won't smell pickled for very long. When you are working with concrete or cement, try cleaning your hands with vinegar, works great. If you are having a problem with ants, just wipe your counters off with a solution of prepared from equal parts of vinegar and water. Crawling insects hate vinegar. It works great on your floors too. 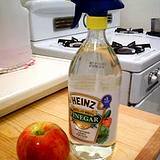 If you find the area the ants or insects are coming into your home spray the area with White Distilled Vinegar. If you rub a scorched mark with a clean soft cloth that has been lightly dampened with vinegar it may remove a scorch mark if it's not too badly embedded. If you add 1½ cups of white vinegar to your rinse water it will brighten up the colors. If you are dying a fabric, add 1 cup of vinegar to the final rinse to set the color. For Tie Dying mix 1 cup of White Distilled Vinegar in with your color mix to set the dye. 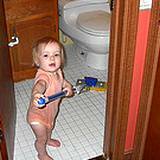 Moisten a toothbrush with white vinegar and rub the area lightly until the crayon is removed. Perspiration stains can be removed by rubbing the area with vinegar before laundering. Vinegar will remove most ink stains if they are fresh. To remove rust, just moisten the fabric with white vinegar then rub the area lightly with salt. Place the garment in the sun to dry, then launder. Add ½ cup of white vinegar to bucket of hot water. If floor is extremely dirty or need disinfected use 1 full cup of white vinegar. By using these methods for vinegar cleaning along with the many tips and trick you'll quickly notice that you'll not only be saving the environment and your home from toxic chemicals, you'll also save an awful lot of money.